Facts and history about the life and beliefs of Native American Indians. Our selection of Native American Quotes & Sayings are taken from many different tribes and many are truly 'Words of Wisdom". The quotes and quotations are taken from the words spoken by great Native Indian Chiefs and leaders such as Sitting Bull, Tecumseh, Chief Seattle (Sealth), Chief Powhatan and Black Hawk. Their quotations, quotes and sayings provide an interesting insight into the views of these famous men in Native American history. The life, history and lifestyle of Native American Indians is a varied and fascinating subject. The following fact sheet contains interesting facts and information on Native American Quotes & Sayings. 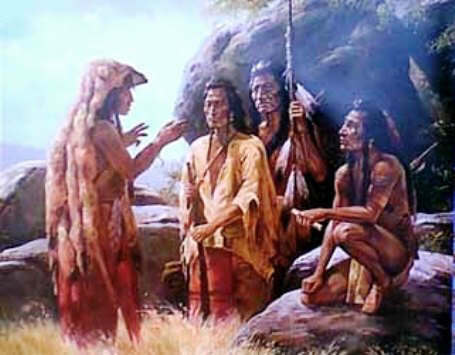 Native American Quotes & Sayings 20: “What treaties that the whites have kept, that the red man had broken?